There’s no shortage of chisels in the world, but almost all of them fall short on two counts: either the handles aren’t able to stand up to vigorous pounding with a steel hammer, or the blade isn’t able to hold an edge. Both these drawbacks are why a set of all-steel, French-made framing chisels caught my eye a number of years ago. 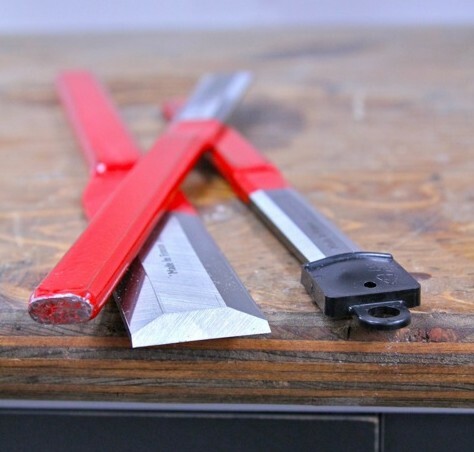 Besides the fact that you can hit these chisels with any kind of metal hammer (even hammers with serrated faces), they’re made from exceptionally good steel. The blades hold an edge at least as keenly as any of my fine bench chisels, and there’s no separate handle to work loose from the blade. This is just the ticket when it comes to the kind of chiselling you might need to do will framing a building or doing renovation work. These chisels range in price from $26 to $41 for chisels from 3/4” to 1 1/2” wide. There certainly are cheaper chisels out there, but none that I’ve seen or used stand up to the rigours of rough use like these ones do. A set of four costs $109.00 from Lee Valley Tools. Click below to watch how I sharpen chisels and plane irons in my shop. For more than 30 years I’ve used the buffing wheel method that you can see in action right here. Be sure to stick around to watch the sharpness test at the end of the video. I think you’ll be impressed. This video is part of my online course on sharpening woodworking tools.